Making Garden Meadows will tell you how to create a meadow area in your garden, full of wildflowers and teeming with wildlife. Also how to ensure its continued beauty through many years. 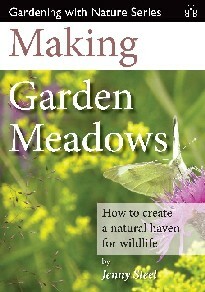 Illustrated with photographs taken in her own garden, Jenny Steel guides you simply through the process to make a meadow from scratch, to create a 'meadow effect' in an existing lawn, to make a spring-flowering meadow and how to enhance areas of rough grass by planting suitable wildflowers. She will also explain how to grow native cornfield annuals, such as poppies and cornflowers and how to ensure they continue to seed and flourish in your garden. A native wildflower meadow is a visual delight and can attract a huge variety of invertebrates, especially bees and butterflies, birds, amphibians and mammals, to even the smallest garden. Before we look at creating this habitat in our garden, it is important to understand just what we mean by the word ‘meadow’. A meadow in the countryside can be many different things, and each wild meadow is unique in its composition of plants and animals. Most people who are interested in creating an area of grass and flowers in their garden or want to convert an area of lawn to an approximation of that wild habitat will have in their minds an image of the traditional hay meadow brimming over with many species of wild flower, including Cranesbill, Knapweed, Oxeye Daisy and Lady’s Bedstraw. In a small garden there may be little room for choice when it comes to deciding where your meadow area will be. However, one thing is quite important. Most seed mixtures for establishing meadows – ‘meadow mixes’ – will contain species that prefer to grow in full sun. Yellow Rattle is rather a special plant. Some meadow mixes will already contain the seed of this annual – one of the few such plants that can successfully be established in a perennial wildflower meadow. It is unusual in that it is partially parasitic on the roots of certain native grasses and has the effect of reducing their vigour.